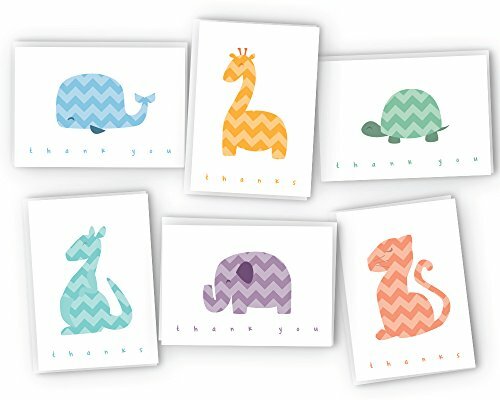 Our Chevron Animals Around the World Baby Thank You Cards variety pack gives you everything you need to thank friends and family for attending a birthday party or baby shower, or sending a gift! It's perfect for colorful chevron animal themed birthday parties or baby showers! This thank you card variety pack features 6 different animals from around the world, each in a different colored chevron pattern - blue, orange, green, teal, purple, and salmon. These baby thank you cards feature an adorable chevron animal and the words "Thank You" below. Our Chevron Animals Around the World Baby Thank You Cards are printed on a white cardstock (80lb Cover) that is made from recycled material. Cards are packaged flat so you can run them through your home inkjet or laser printer if desired and are scored so you can fold them easy & straight! A matching amount of White Envelopes are included. Each baby thank you card measures 4.875" x 3.375" when folded and 4.875" x 6.75" when unfolded. Envelopes are the standard A1 size with a square flap and are made from 28lb bond paper. Gummed for sealing. If you have any questions about this product by Hill Valley Greetings, contact us by completing and submitting the form below. If you are looking for a specif part number, please include it with your message.